It’s no secret that we love gorgeous looks and chic style here at KF. We especially adore a chic outfit that is striking and can go from meetings to dinner or drinks with ease. When we plan out our outfits, the goal is ensembles that look gorgeous (and are comfortable too) no matter where we are headed for the day. Whether it’s to a luncheon, the office, a meeting or cocktails, we’re always ready to dress for it all. According to KF, it’s actually pretty simple to take a day-time outfit to a social event if you prepare accordingly. A quick change of shoes, bags, and jewelry instantly changes the entire feeling and impact of your look. 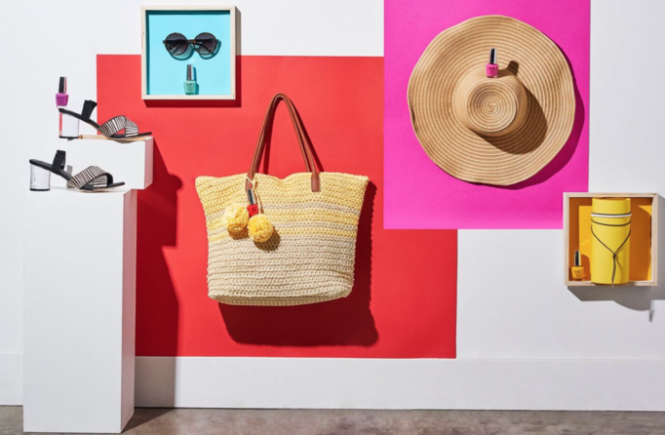 KF’s advice… start by picking out chic pieces that are appropriate for wherever the day is taking you, yet are stylish and fit your body type well. You can instantly take a chic outfit from the morning to the evening, from lunch to an event with just a little planning! And being the wife, mother, and business owner on the go that she is, we think we will take her advice. This blouse goes with everything! It’s classic styling with subtle, yet fantastic details make it instantly striking. However, don’t let the word classic fool you. This top makes a modern statement, and has unique details, which is key when you are choosing pieces with impact for your wardrobe. With sheer inlets and an interesting neckline, it’s a perfect go to with jeans, skirts, and pants. It’s also simple enough to be worn with statement-making bottoms for max impact. Kathy’s outfit is the perfect choice to go from day to night for the busy lady. 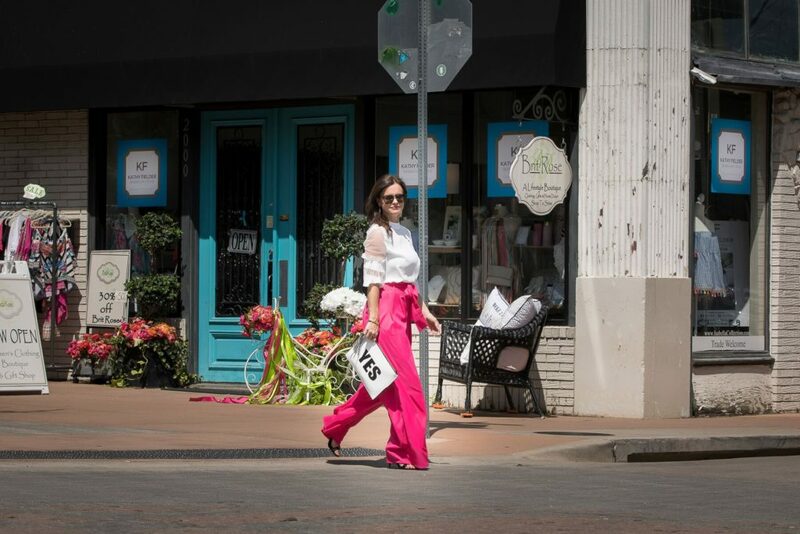 From her boutique KF Design | Life | Style, these fabulous hot pink palazzo pants paired with a classic white blouse from The Brit Rose Collection are instant hits that can go from day to evening with ease. KF tip ~ to go from day to evening, go from slides to heels. Add impactful jewelry, such as a cuff, statement necklace, and feathered earrings (super on-trend). Finally, keep a clutch like the one KF is carrying in your day time bag so you can pull it out and walk into dinner or cocktails chic and put together. Lastly, put on a darker, more impactful lip color and you are ready to go! Kathy’s boutique is located on 2000 Greenville Avenue in Dallas, TX. It is a home, fashion, and lifestyle boutique selling everything from clothing to textiles. It’s also Home base for The Isabella Collection, designed and manufactured by Kathy Fielder, it’s a chic line of home textiles that will make your life more beautiful. The boutique also houses Brit Rose, a fabulous clothing and accessories store that supports a phenomenal cause, suicide prevention and mental wellness causes through The Brit Rose Foundation.